Download "What's the Spin? - Discover Properties of Geometric Rotations"
2 center of rotation. Move the cursor to the number; when the message "using this angle" appears, press ENTER. The original triangle has been rotated around the center by an angle of 60 degrees. It is possible that the entire image triangle does not appear on the screen. Try dragging the center of rotation point until both triangles appear. Observe that the rotation has been in a counterclockwise direction. Press F1 and choose 1:Pointer. Drag one of the vertices of the original triangle. Observe what happens to the image triangle. It has been determined that the image triangle can be altered by altering the original triangle and that the position of the image triangle can be changed by dragging the center of rotation point to various locations. Now experiment with trying to change the position of the image triangle by changing the rotational angle. Press F7 and choose 6:Numerical Edit. Move the cursor to the number; when the message "this number" appears, press ENTER. This will create an edit box around the number, allowing you to change the number. Delete the number 60 and type in the number 100. Observe the new position of the image triangle. Experiment with different numbers including 180, numbers larger than 180, 360, numbers larger than 360, and negative numbers. Make conjectures about the results of rotating the triangle through these various angles. Teacher Note: The conjecture should be that a rotation by a positive angle rotates in a counterclockwise direction. A rotation by a negative angle rotates in a clockwise direction. A rotation by 180 degrees accomplishes a half-turn around the point. A rotation by 0 degrees or 360 degrees produces equivalent results, a rotation back onto the original triangle. Numbers larger than 360 revert back to their equivalents modulo 360. Switch the number back to 60. The triangle has been rotated 60 degrees counterclockwise around the center of rotation point. Determine the location of the 60 degree angle. Teacher Note: The angle can be located by constructing a segment from the center of rotation point to a vertex of the original triangle and a segment from the center of rotation point to the corresponding vertex of the image triangle. This forms an angle whose measure corresponds to the number in the numerical edit box. 3 Press F6 and choose 1:Distance & Length. Measure the distance between two vertices of the original triangle and then measure the distance between the corresponding vertices of the image triangle. Press F6 and choose 3:Angle. Measure one of the angles of the original triangle and then measure the corresponding angle of the image triangle. Press F1 and choose 1:Pointer. Drag each of the vertices of the original triangle. Make a conjecture about the lengths of rotated segments and the measures of rotated angles. Teacher Note: The conjecture should be "rotations preserve distances and angle measures." Activity 2: Press F8 and choose 8:Clear All. Press ENTER to clear the screen for the next construction. Press F3 and choose 3:Triangle. 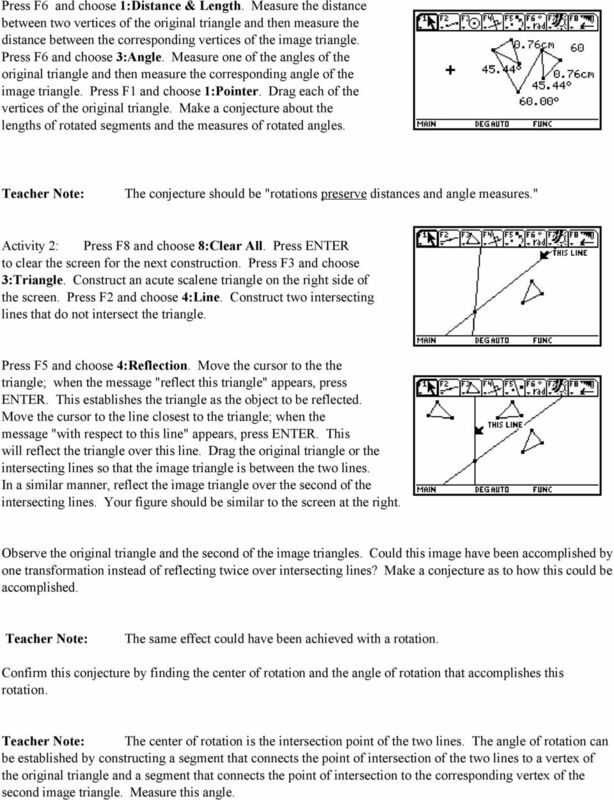 Construct an acute scalene triangle on the right side of the screen. Press F2 and choose 4:Line. Construct two intersecting lines that do not intersect the triangle. Press F5 and choose 4:Reflection. Move the cursor to the the triangle; when the message "reflect this triangle" appears, press ENTER. This establishes the triangle as the object to be reflected. Move the cursor to the line closest to the triangle; when the message "with respect to this line" appears, press ENTER. This will reflect the triangle over this line. Drag the original triangle or the intersecting lines so that the image triangle is between the two lines. In a similar manner, reflect the image triangle over the second of the intersecting lines. Your figure should be similar to the screen at the right. Observe the original triangle and the second of the image triangles. Could this image have been accomplished by one transformation instead of reflecting twice over intersecting lines? Make a conjecture as to how this could be accomplished. Teacher Note: The same effect could have been achieved with a rotation. Confirm this conjecture by finding the center of rotation and the angle of rotation that accomplishes this rotation. Teacher Note: The center of rotation is the intersection point of the two lines. The angle of rotation can be established by constructing a segment that connects the point of intersection of the two lines to a vertex of the original triangle and a segment that connects the point of intersection to the corresponding vertex of the second image triangle. Measure this angle. 4 Confirm this is the correct rotation by rotating the original triangle around the point of intersection of the two lines using the measured angle. Teacher Note: Although the screen appears not to have changed, a rotation has occurred. To confirm the image of the rotation is the same as the second image of the composition of the two reflections, press F1 and choose 1:Pointer. Move the cursor to the second image triangle and press ENTER. A message will appear asking if you wish to choose the triangle created by the two reflections or the triangle created by the rotation. Activity 3: The figure from Activity 2 will be used for this activity. Drag any of the vertices of the original triangle to various locations on the screen. Next drag the entire triangle. Finally, drag either of the reflecting lines. While performing these activities, observe the angle between the reflecting lines and the rotational angle. Make a conjecture as to their relationship. Teacher Note: The conjecture should be "the two reflecting lines form an angle that is one-half the measure of the rotation angle". Confirm this conjecture by pressing F6 and choosing 3:Angle. Measure the angle between the intersecting lines. The displayed measure of the angle between the intersecting lines may not be exactly one-half the measure of the rotation angle. This discrepancy is due to the precision of our measurement. To confirm the conjecture, press F6 and choose 6:Calculate. Calculating the ratio of the two angle measurements will confirm the conjecture. Based on your knowledge of reflections, explain why the conjecture must be true. Teacher Note: Constructing a third segment from the intersection point of the lines to the corresponding vertex of the first image triangle will explain the conjecture. Since reflections preserve angle measures, two pairs of congruent angles are formed. The angle between the lines is the union of two angles, one angle from each pair; the rotational angle is the union of all four angles. Extension: Determine if the composition of two reflections is commutative. In other words, will the reflection image remain the same if the triangle is first reflected over the farther line and then that image triangle is reflected over the closer line? 2. If C is the midpoint of AB and B is the midpoint of AE, can you say that the measure of AC is 1/4 the measure of AE? 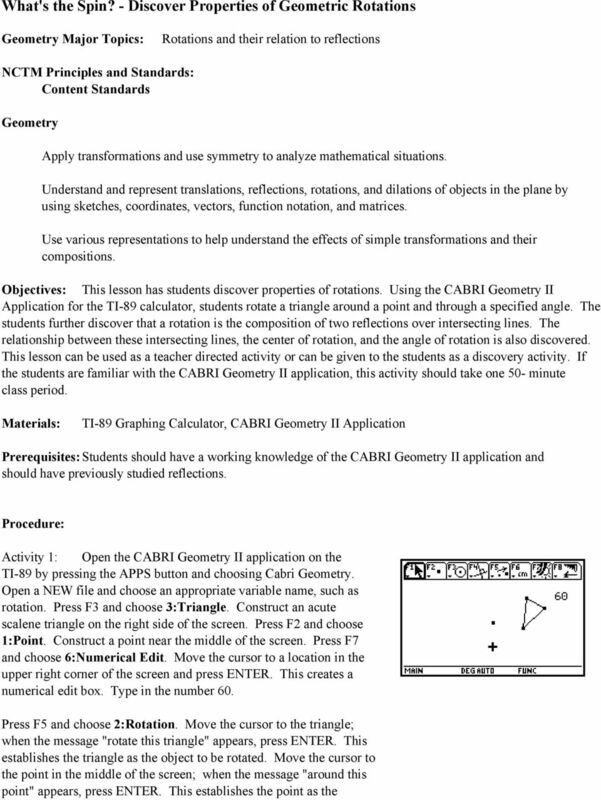 Dilation Teacher Notes Teacher demonstrations using GeoGebra are essential at the beginning of this unit. 1. Dilation The definition of a dilation is more complicated than the definitions of the isometries. ^Åíáîáíó=NU Objectives To investigate the special properties of an altitude, a median, and an angle bisector To reinforce the differences between an altitude, a median, and an angle bisector Cabri Jr. Teacher Page. 1. Reflect a figure with vertices across the x-axis. Find the coordinates of the new image. 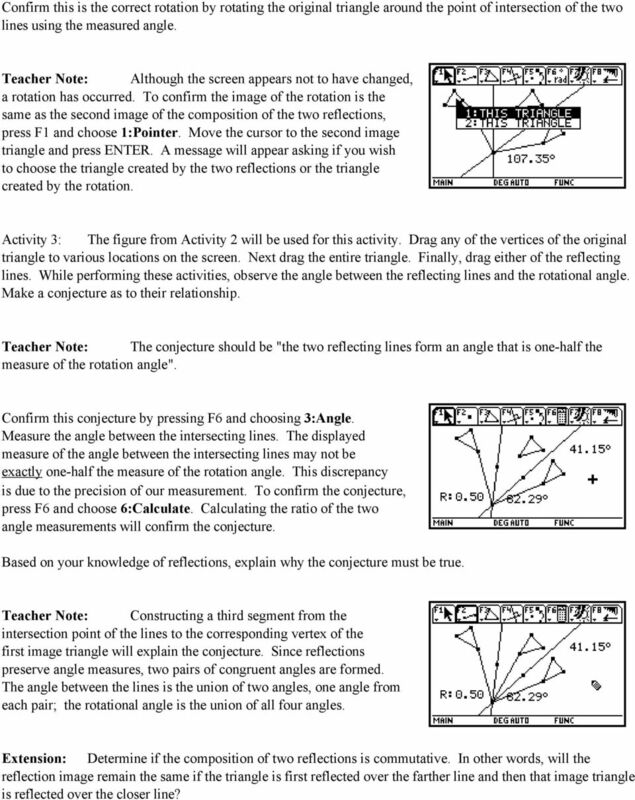 Investigating Relationships of Area and Perimeter in Similar Polygons Lesson Summary: This lesson investigates the relationships between the area and perimeter of similar polygons using geometry software. Angle Bisectors in a Triangle ID: 8892 Time required 40 minutes Topic: Triangles and Their Centers Use inductive reasoning to postulate a relationship between an angle bisector and the arms of the angle. MA.7.G.4.2 Predict the results of transformations and draw transformed figures with and without the coordinate plane. Congruent Triangles, Discovery Day 2 Name: October, 2014 1 Triangles! We ve talked about congruence of segments and angles. Notice that an angle only has one measure, and a segment only has one length. 4. Prove the above theorem. 5. Prove the above theorem. 9. Prove the above corollary. 10. Prove the above theorem. 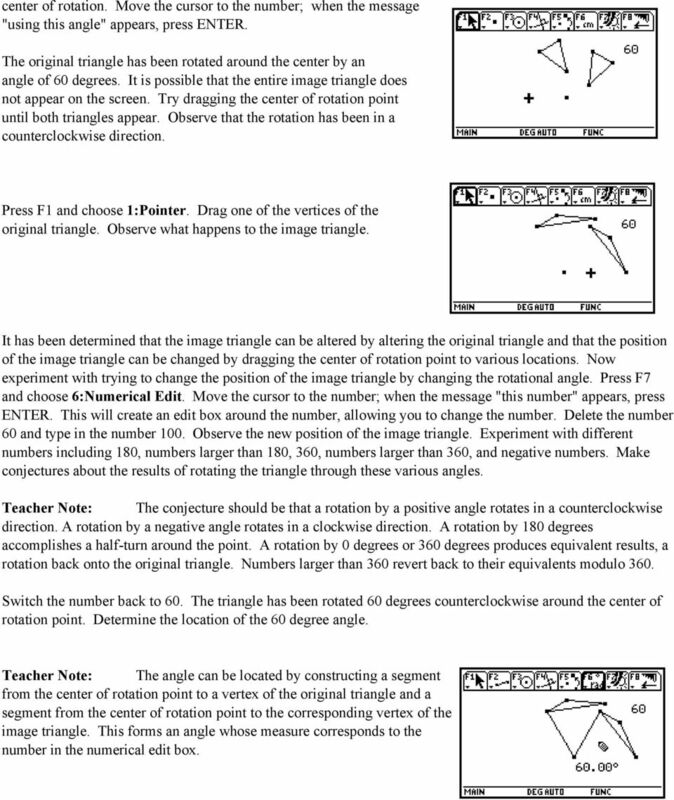 Centers of Triangles Learning Task Unit 3 Course Mathematics I: Algebra, Geometry, Statistics Overview This task provides a guided discovery and investigation of the points of concurrency in triangles. Activities Grades K 2 THE FOUR-SQUARE QUILT. Put triangles together to make patterns. Lesson 10-7 Rotations Textbook Pages: Homework Study notes for open note bellwork quiz on all 4 types of transformations. 2. Select Point B and rotate it by 15 degrees. A new Point B' appears. 3. Drag each of the three points in turn. In this activity you will use Sketchpad s Iterate command (on the Transform menu) to produce a spiral design. You ll also learn how to use parameters, and how to create animation action buttons for parameters.